Trackless Train - Jumpin Jiminy - Make Your Events Awesome. Gather up the kiddos and hop on the train. Jumpin Jiminy's trackless train can go where others have not gone before. The train comes with an engineer who will help your passengers as they load and unload. Riders: 12 to 21 people at a time both adults and children. Perfect for company picnics, church VBS, and school carnivals. 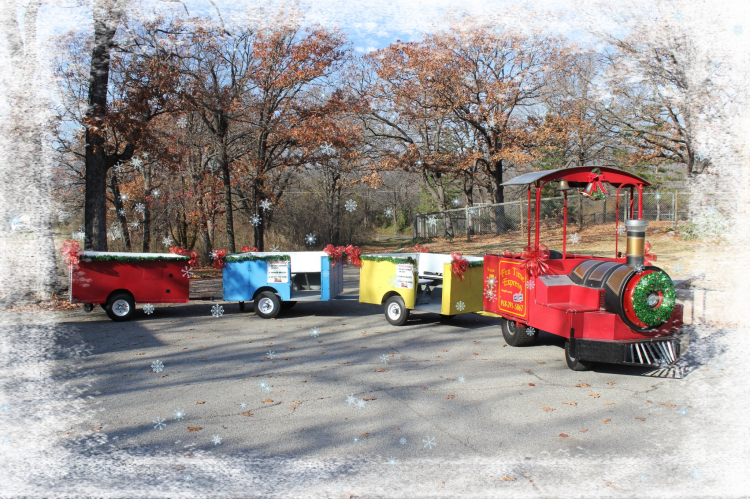 In the winter months, we deck our train out with lights and bows and greenery...the perfect Polar Express for your winter holiday or Christmas event! With service to all of Oklahoma, we are ready to help you. Also serving Arkansas, Kansas and Missouri.